A woman makes waffle cones at La Casa Gelato, an ice cream factory near Commercial Drive in Vancouver. Ricepaper magazine, the Vancouver literary and cultural quarterly aimed at Asian Canadians and those who presumably wish they were, has launched Ricepaper Shutterbox, a three-times-a-week posting of photographs taken by staff, local photographes and sometimes readers. "If you have any photos that you feel would fit the blog and inspire us, send them our way! 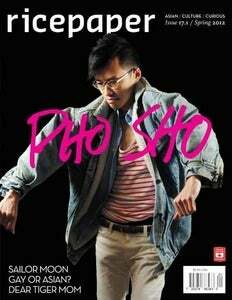 (photo@ricepapermagazine.ca) By showcasing the creative, diverse talents of our community, we hope to visually immerse you in culture and challenge notions of what it means to be Asian Canadian." Rogers Media is launching a television show based on Chatelaine magazine on the Rogers-owned Citytv. Chatelaine Day begins Monday, Aug. 14, according to a story in Masthead and will present the "key ingredients" of the magazine; food, health, decor, style and beauty. It is not so much a regularly scheduled show as a series of hour-long specials that will be shown throughout the year. Videos based on Chatelaine content -- mostly food-related - are already available on Rogers Anyplace TV. Avenue magazine (Redpoint Media Group) has once again published its list of the 25 best neighbourhoods in which to live in Calgary. The list is based on reader definitions of what's important and hard data from the city of Calgary, all of which is crunched by Leger Marketing. "The survey says low crime, good commute times and pedestrian-friendliness are highly desirable," says a posting on the Avenue website. "Calgarians want their neighbours to be friendly and the homes along their streets to be well maintained. "We care more about playgrounds and recreation facilities than we do large yards and low density. While we don’t necessarily need to live near family or friends, we do want access to pubs, restaurants and coffee shops where we can meet them. And we love good value, which means keeping a keen eye on neighbourhoods where property values are on the rise." The number one neighbourhood is Varsity, next door to the University of Calgary; number two is Arbour Lake and number three is Bowness. You can download a pdf of the whole database. 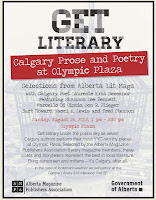 Trying to tie a magazine's cover to an event that is weeks away is a nerve-wracking experience for an editor. But sometimes the magic works. A great example is the current issue of Reader's Digest, which features diver Jennifer Abel. With her teammate Emilie Heymans, Abel claimed Canada's first medal -- a bronze -- of the 2012 Olympics (weeks after the issue went to press. )The issue also has profiles of an array of contenders, including wrestler Khetag Pliev, boxer Mary Spencer, fencer Phillipe Beaudry, chef-de-mission Mark Tewksbury and the feature on Abel by Malcolm Johnston. It's one of those things that seems so obvious, one wonders why it wasn't done before: a ranking of magazines by their Twitter following. Gary Campbell, formerly the web creative director for St.Joseph Media (and creator of Aggregation magazine) has compiled a top 35 list of Canadian magazines based on their followers. As a fair and reasonable chap, he also makes it clear he is only using the data as a measure of quantity, without making any judgements about the quality of followers; he is trying to use the metric to quantify "reach". Campbell says he is working on a Facebook version of the index. The study measures brand competence across website, digital marketing, social media and mobile platforms; this year it also includes use of tablets. Points are given for how well content, marketing, engagement and advertising tactics are deployed within and across five segments. David Remnick, the editor of The New Yorker, talking about the art of the profile. It has been confirmed that Explore magazine has been sold in a deal with OP Publishing of Vancouver which involves a swap whereby OP's Cottage magazine moves to Cottage Life Media Inc. The financial details of the transaction have not been revealed. However there is a clear benefit to Cottage Life Media Inc. which is now better able to offer a national buy to advertisers. Despite it undeniable success, the great majority of Cottage Life magazine's paid circulation of 70,000 (905,000 readership, according to PMB) has always been in Ontario; this will now be augmented with the largely western circulation of Cottage, which claims a readership of 20,000. Explore magazine, is reported to have been sold by Cottage Life Media Inc. of Toronto to OP Publishing of Vancouver. Although there has been no official confirmation, its winter issue will be the last under the editorship of James Little and art director Gary Davidson. OP Publishing produces Western Sportsman, B.C. Outdoors Sport, Pacific Yachting, Pacific Yachting - Pacific Northwest, Cottage, and Canadian Aviator. Explore, a quarterly which has a paid circulation of about 25,000 has been part of a stable of special interest publications put together by what was then Quarto Communications, the flagship of which is Cottage Life. Other pubs are Canadian Home Workshop and Outdoor Canada. 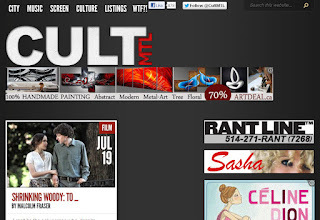 The sale is in the wake of considerable restructuring at Cottage Life Media following a significant minority purchase of the company by specialty television player Blue Ant Media, controlled by Michael Macmillan, but also owned in part by Torstar. Founded in 1981 in the past seven years Explore has been named Best Magazine of the Year by the Canadian Society of Magazine Editors three times. Since 2001, it has received 174 National Magazine Awards nominations and won 26 Golds and 29 Silvers (the third most during that time, after the Walrus and Toronto Life). It also holds the distinction, in the fall of 2005, of being the first glossy magazine in North America to publish on 100 per cent post-consumer recycled paper. "Now is the time that Alternatives must facilitate the voice of environment louder than ever, so this redesign is also the most critical to the future of our 41-year-old magazine. Alternatives began in the fledgling years of the environment movement, when Environment Canada, Greenpeace, World Wildlife Fund and loads of other like-minded organizations began taking shape." As one of the reasons for retaining them, Ruby points to the positive impact that a K9 redesign had for East Coast Living, boosting advertising and newsstand sales after the magazine won the redesign in a national competition. "The redesign process will not only produce a new aesthetic cover-to-cover, we will pull apart every nook and cranny to reveal all the areas that need to be overhauled," says the K9 release. "Editorial, circulation strategy and launch are all under scrutiny." 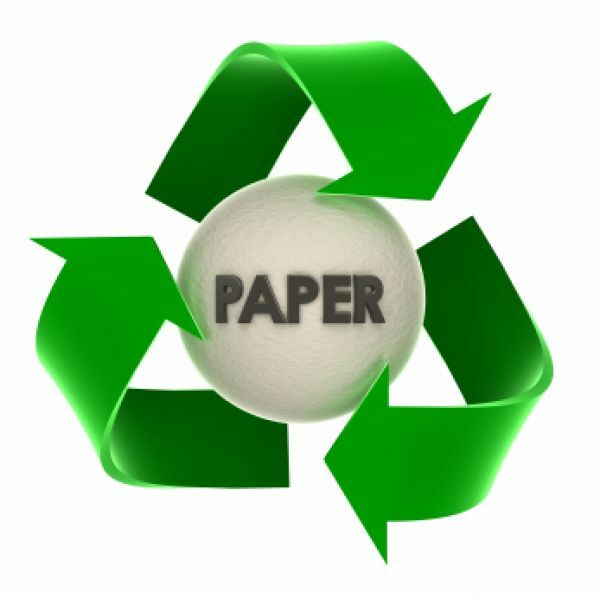 The folks at Canopy, the people who brought you the Eco Paper Database to make it easy to find green paper solutions, have alerted us to a "green paper" called Green in All Grades, produced by one of their U.S. counterparts, Green America and its Better Paper Project. The hefty (40-page) report aims at dissecting the key arguments made against use of recycled paper to print magazines and showing how it can be the best choice for the environment. 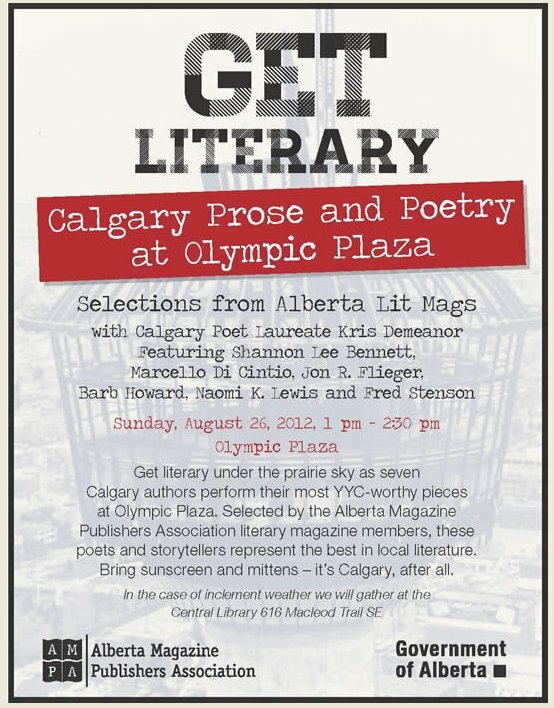 Short stories and poetry from some of Alberta's best literary magazines will be read en pleine air (outdoors to you) at the Olympic Plaza in Calgary on Sunday, August 26 from 1 p.m. to 2:30 p.m.
"Bring sunscreen and mittens -- it's Calgary, after all," say the organizers. The first shoe to drop was the announcement this week that the Harman family was no longer going to invest in Newsweek and the Daily Beast. The second shoe is the announcement by IAC/Interactive Corp (IACI) that the 79-year-old newsmagazine would probably move to online-only publication as early as September. Barry Diller, the chairman of IACI, made the announcement during a quarterly earnings conference call, according to a story in Bloomberg. IACI owns the Daily Beast online, which was started by Diller and former Vanity Fair editor Tina Brown. The Daily Beast was merged with Newsweek in 2011. IAC, which makes most of its revenue from the Match.com and Ask.com websites, reported a 2.1 percent gain in second-quarter net income to $43.3 million. Sales increased 40 percent to $680.6 million. Though there's a lot of grumbling about the increasing cost and decreasing response rate of direct mail in magazine circulation offices, the fact is that most magazines rely on this audience-building tool at least part of the time. Part of the reason is that there is nothing that has turned up, yet, to replace it. A recent report by the [U.S.] Direct Marketing Association says that while direct mail response rates have dropped nearly 25% over the past nine year, mail campaigns still draw better than digital channels or e-mail. Direct mail gets an average 3.4% response to a house list; email 0.12%. When the higher costs of direct mail are taken into account, cost-per-sale is about the same for direct mail, email and paid online search. Cycle Canada magazine has been sold by LC Media to Les Editions Jean Roberts Inc. According to a story in the website CMG Online, the deal included Moto Journal. There is no information on the company website about the ownership change. LC Media purchased the magazines from Turbopress Inc. of Toronto and Brossard, QC and later narrowly escaped bankruptcy in 2007. Les Editions Jean Roberts Inc. describes itself as the number one hobby magazine in Quebec and is better known for a range of publications about crafts, decorative arts, sewing and knitting. After four years of publishing, the Manitoba magazine Hearts of the Country is closing. Editor Cindy McKay in a farewell note to her readers for the August-September issue says advertiser support just wasn't there, though readers were loyal and supportive. "The challenges we have faced in gaining advertising support for this magazine has been deflating, to the point where it’s time to say goodbye." McKay said that word would be going out soon about options for the remainder of subscribers' terms. 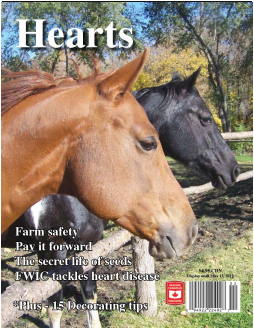 Hearts, which was published 6 times a year at a sub price of $26.95, was aimed at rural people -- and especially rural women -- and their families.It was launched in 2008 at the Farmwomen’s Conference in Brandon Manitoba, inspired by a much-loved and missed publication called Farmwoman (published by Grainews in the mid 1990's) which closed, as did the popular Western People (published by Western Producer). Hearts aimed to spread out from its original base in the Interlake region of Manitoba. At the time of its closure, it said it had 10,000 readers in rural western Canada. The Kit, the online and print fashion and beauty publication owned by Toronto Star Newspapers Ltd., has announced the appointment of a new editor-in-chief -- Christine Loureiro, formerly the deputy Life editor at the Toronto Star. She replaces Doug Wallace, the editor for The Kit since it was founded in September 2010 as a digital-only beauty magazine. While relinquishing the title editor, Wallace remains as Chief Content Officer associate publisher, content. The startup publication was acquired by the Star Media Group in 2011 and soon thereafter extended its mandate to encompass fashion and launched a weekly print publication. Quote, unquote: Do we want attack dogs? "At some stage soon, before a whole generation of journalists are criminalised, politicians are going to need to make a choice. Do we want to encourage a robust, probing and risk-taking national press which holds the public sector to account? "Or would we rather have a legion of placid copy-takers on Fleet Street, meticulous in their adherence to the letter and spirit of the law and happy to simply take down the official story from the PR officers who vastly outnumber them." -- Dominic Ponsford, the editor of Britain's Press Gazette, blogging about the dawn arrest of a Sun news reporter Rhodri Phillips in connection with a pay-for-information investigation that has blossomed out from the News International investigation about phone-hacking. So far, 21 journalists have been arrested, charged and bailed as part of the Elveden bribes inquiry. Toronto Star cuts its relationship in a print edition of The Onion. Any tears? "Toronto has long been one of the Top-10 cities for The Onion's online audience," said "I think it's the perfect place for The Onion and A.V. Club to make their first foray outside the United States. Toronto has a tradition of great comedy as well as being a really smart, cosmopolitan city that has a natural audience for our pop culture coverage as well." "Not only that, the labour disruption only cost Canada Post about $58 million, not 'hundreds of millions' as claimed by Canada Post President Deepak Chopra,' said Lemelin. The paper also shows that while some businesses were negatively affected, there is no evidence the rotating strikes threatened their viability. It shows charities, non-profit organizations, seniors groups, and rural and remote organizations experienced some temporary negative impacts. The whole research paper can be downloaded here as a pdf. A large number of businesses and organizations across the country, including not-for-profits, seniors groups and charities, were surveyed as part of the research. 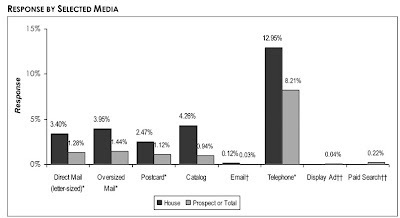 Among the business organizations polled were the Canadian Marketing Association, the Canadian Federation of Independent Business, the National Association of Major Mail Users and Magazines Canada. The study paraphrased president Mark Jamison's June 15 2011 letter to Labour Minister Lisa Raitt emphasizing the importance of postal delivery to Canadian-content magazines. The CUPW researchers requested an estimate of the number of workforce reductions that may have occurred as a result of the disruption, but says it did not receive a response. 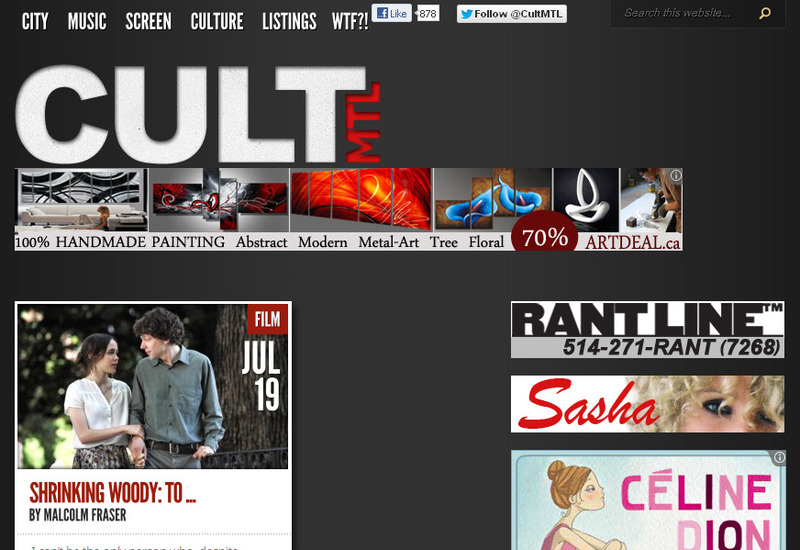 Former staff and contributors to the weekly Montreal Mirror, shut down by its owners Quebecor Media recently, have launched an online arts and culture website called CultMTL. "We all worked at the Montreal Mirror, either in editorial or as freelancers or both. Our aim is to serve Montreal as we used to, but with a fresh format and voice. We will deliver daily coverage of the city, from news to culture to event listings and recommendations for things to do, see and hear. Because there’s never a shortage of stuff to do, just a shortage of savvy voices to steer you to the best of it," says a note on the site. Sparksheet, which describes itself as a "multiplatform magazine", published by Spafax, the content marketing agency (and the people who contract publish enRoute magazine) has launched a new monthly audio podcast called "Good Ideas". The 15-minute pilot episode is called "Brand Brazil" and explores the concept of "country branding". Each subsequent episode will introduce and define a "Sparkword". In a sense, we have magazines to thank for air-conditioning which has been welcome in the recent heat wave gripping North America. I know I'm inclined to give magazines credit for a lot, but this time I have a story in the New York Times to back me up. And the paper says that Willis Carrier, the inventor of air conditioning, did it to allow a long-gone weekly magazine called Judge to be printed in the midst of a sticky Brooklyn summer in 1902. Apparently the sheetfed magazine's ink wouldn't dry and the pages would absorb humidity, ruining registration. Junior engineer Willis Carrier -- who went on to the create the Carrier Corporation, well known for air conditioning and furnaces -- cooled the plant by forcing air across pipes filled with cool well water and later added a compressor-run refigerating machine to cool the pipes faster. Ultimately, he figured out even better ways that began to cool places like movie theatres and Madison Square Gardens. 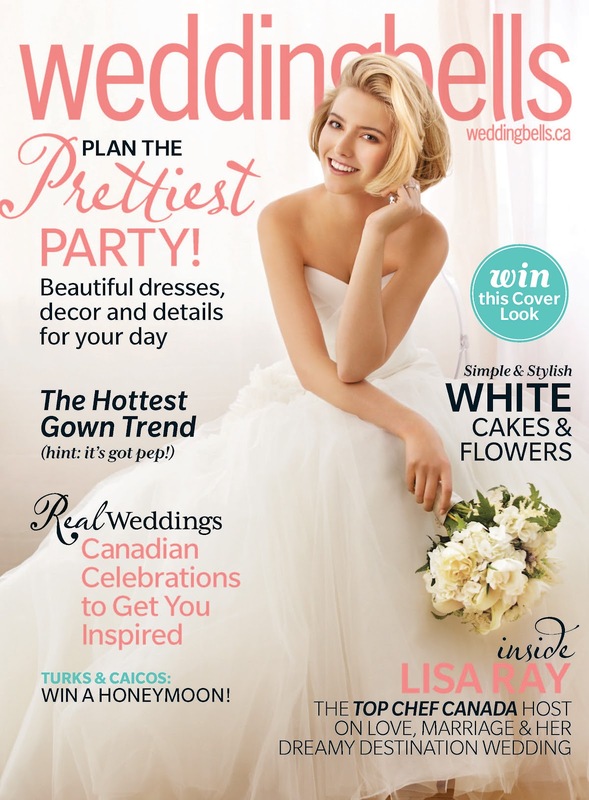 Weddingbells magazine, with its Fall & Winter 2012 issue on the newsstands today, has a new, lighter, brighter look, the result of a front-to-back redesign. Weddingbells is published twice a year by St. Joseph Media and recently launched its first-ever special interest publication called Weddings, which is clearly intended to become an annual. The app allows a person to pay or renew parking fees for a specific spot and duration, and also alerts the user before the parking period expires. Hurried motorists can access the app free of charge on iPhone, BlackBerry and Android smartphones. It’s also available online and at pservicemobile.ca for the mobile version. Users will pay 40 cents per transaction with part of that revenue going to TC Media, which also shared in development costs. TC Media said it registered 13,000 subscriptions to the new service in the first week. Access Copyright, the Canadian copyright licensing agency, says while it is concerned about yesterday's Supreme Court decision about photocopying in elementary and secondary schools, the decision leaves blanket licensing of hard copy and digital materials in schools intact. "The fact is the Supreme Court was only looking at about seven percent of the copying done in schools,” Maureen Cavan, Executive Director, Access Copyright, said in a statement emailed to media and posted on its website. "The decision absolutely does not mean a free-for-all on copyright-protected materials used in the classroom. On the contrary, it leaves copyright licensing in the education sector alive and well." The Supreme Court decision did not pass judgement on whether the copying was "fair" under the terms of the Copyright Act, leaving that determination to the Copyright Board. By referring the case back to the board, the court left it to decide whether the ruling changes the terms of the tariff it granted to Access. Andrew Losowky, the Huffington Post book blogger and correspondent for MagCulture, is interviewed by German site Gestelten. You may be able to teach an old dog new tricks. The Canadian Kennel Club (CKC) is circulating a request for proposal for a contract publishing partner to relaunch Dogs in Canada magazine and its annual. "CKC is seeking a publishing partner who will act as a single point of contact and will coordinate the entire lifecycle of the publications. Candidates should outline a revenue model that will cover all costs from concept to delivery of the magazines, and will generate revenue for the CKC [the RFP says, in part]." The RFP says that the prospective partner would handle all project management, ad sales and marketing, design, editorial planning and development, printing and circulation management with the CKC approving annual sales and editorial plans and the layouts of all issues, supporting ad sales and keeping the publisher abreast of changes in the industry that would affect editorial and sales planning. The struggle over the selling of magazine covers seems to have been all but lost, at least at one of Canada's largest consumer publishers, TC Media. The current issue of Elle Canada has a standard cover, immediately followed by a second one that is an ad for Sally Hansen nail polish. It features the same cover model (Meghan Collison), the magazine logo and an indistinguishable cover type treatment. There is no label indicating that the second cover is a paid ad. And both the main cover and the ad were art directed by Elle Canada art director Beatriz Juarez, edited by fashion editor-in-chief Denis Desro and photographed by the same photographer Jean-Claude Lessier. The cover seems to transgress both the letter and the spirit of the industry guidelines that are intended to ensure that the separation of editorial content and advertising images must be transparent to the reader. TC Media has hired Joanne Acri from Yahoo! Canada to be its digital marketing director in Toronto. As such she's going to be responsible for developing and implementing digital marketing plans for the various TC Media business groups. 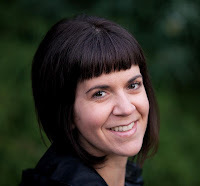 She had been senior manager, B2B marketing at Yahoo! Avenue magazine, the Calgary-based city lifestyle title, has used the occasion of the Calgary Stampede to launch a free iPad app of the magazine. Avenue is published by the Redpoint Media Group, which also publishes Avenue Edmonton, Wine Access and Westjet's up! I don't know about you, but cluttering up my desk drawer are several defunct tape machines and the probably-not-defunct tapes that were used in them. Since I wasn't very careful labelling them, I'm not sure which are meaningful recordings of long-ago interviews (doubtful) and which merely blank or unintelligible. However, I was very interested in a recent post by the Nieman Journalism Lab about a non-profit media organization that aims to resuscitate old tapes. David Gerlach, a former TV producer runs a company called DG Multimedia Inc.and he founded Blank on Blank, a Brooklyn-based project to resuscitate never-before-heard tape from journalists’ reporting archives. Gerlach says his years in television left him with a nagging sense of loss over the material that never aired. Journalists submit old tape, and his production team polishes it up. In some cases, even animating it. For instance, there's an example of the “lost tape” from Anthony Bozza’s Rolling Stone interview with U2 frontman Bono in October 2001. Other examples include a conversation with Martin Scorsese about the use of soundtracks in his movies; Radiohead’s Thom Yorke on his reputation; Alan Ginsberg’s recording of a hospital visit to actor/director/poet/activist Julian Beck; and puppeteer Caroll Spinney on voicing Big Bird and Oscar the Grouch. Journalists don't get paid for loaning their tapes, but Gerlach says he hopes to create a viable business model that eventually will compensate contributors. The organization is in the midst of a 30-day Kickstarter campaign. “There’s a huge historical impact we could have, just getting journalists to dig into their archives,” Gerlach said. 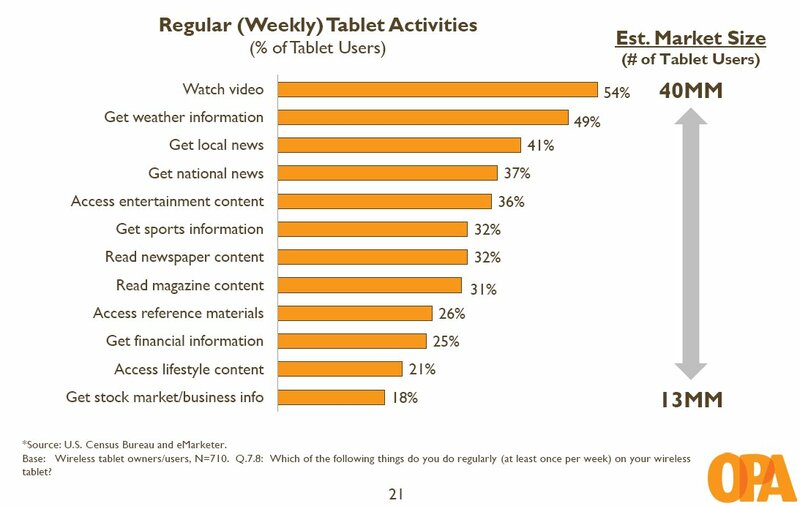 The tablet marketplace is changing at warp speed and this is well illustrated by just-published data from the Online Publishers Association. While the data is exclusively U.S., it most likely is echoed in Canada. The survey, conducted in collaboration with Frank Magid Associates, shows that the U.S. table-adopting population is 31% in 2012 and is expected to reach 47% by the second quarter of 2013. 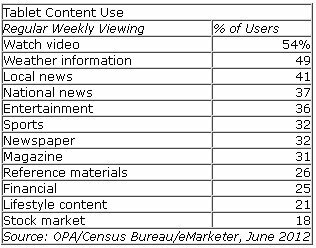 A summary of results were published by MediaPost. 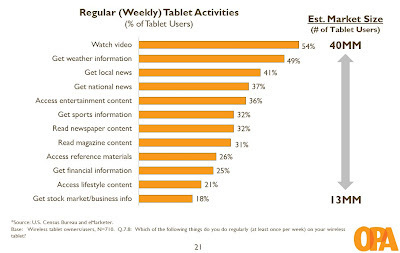 The majority of tablet users do so several times a day and say they use them 14 hours a week. A pdf of the PowerPoint summary is available for download. for about $1 a day. The keynote at the Magazines Canada luncheon as part of the MagNet conference early last month featured the affable President and CEO of Canada Post, Deepak Chopra. And while most of his address was a feel-good ramble about partnerships and the digital way of the future for his organization and the publishers there gathered, he had brought one announcement: The weight of enclosures in a magazine would be going up from 100 grams to 250. What a lot of the people in the room thought that meant was that maximum weight for Publications Mail would be going up commensurately, from 1.36 kg to 1.51 kilos. Not so. Magazines Canada has now published a clarification, provided by Canada Post. The weight increase only applies to Sample Promotional Novelty Items (for instance, an enclosed a pen or a CD) but the current maximum item weight for an issue using Long Carrier Presort (LCP) remains the same at 1.36 kg. The bottom line is that publishers will be able to send heavier samples enclosed with magazines, increasing potential for including advertiser promotional items with magazines. A subscription to Rogers Media's Sportsnet magazine -- coming up later this summer on a year old -- is being sold for a buck a copy. A special offer gives 10 issues for $10, including a free iPad access tool. The offer for the biweekly points out that 10 issues cost less than two beers at the stadium. The magazine is normally sold for $29.99 for 26 digital issues and or $29 a year for 26 print issues (both plus tax) -- effectively $1.15 an issue. Comparable per-copy prices for other Rogers consumer magazines: MoneySense $3.13; Hello $2.08; Maclean's $1.00; Canadian Business $0.95; Chatelaine $1.24; LouLou $1.87, Flare $1.25. They weren't the first magazines and probably won't be the last to close up shop, leaving subscribers in the lurch. Back in February, YES and KNOW magazines of Victoria, B.C. were suddenly shut by the Mad Science Group of Montreal. At the time, there were muted noises from the company's counsel that some arrangement would be made to compensate people who paid their money and were not getting their magazines, a refund or or any alternative. Since then, nothing. Similarly, in August last year, Harrowsmith Country Life, the six-times-a-year magazine published by Malcolm Publishing, was closed and the staff let go. Some subscribers -- a minority -- who had bought their subs through the Rogers Subscription Service, had their contracts fulfilled by receiving Garden Making magazine. Other, persistent subscribers (but only if they were really persistent) were reported to have gotten their money back by pestering the publisher. But many others were left hanging. In both instances, it sometimes took a while for readers to even realize that they'd been had; when they did, however, they sometimes lamented the loss of magazines they loved as much as they railed against the business practices that took their money and didn't deliver the goods. In either case, this can't be good news for the magazine industry generally. "I noticed too late that the magazine subscription I was giving as a gift had not shown up. I'm really furious that the Mad Science Group was taking subscription money right up until the last day. It's unethical, in my opinion." "I am so angry about this. I loved that magazine. I don't even care that I lost 40 bucks when I renewed my subscription at Christmas. Harrowsmith was a Canadian jewel and to see it being wiped away because of mismanagement really ticks me off." Publishers sometimes seem to think that because an individual subscription transaction is relatively small, the fuss subscribers make should be equally modest. Nobody will be going to small claims court over a $30 sub. But often forgotten is the reasons these people bought these subs in the first place, for themselves, for their families, as gifts, for their grandchildren and so on.